The bottom line is that we want to share Oktoberfest with any many people as possible. With that in mind, we have created an option that will work with any dates and should meet most budgets. 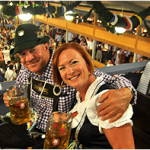 With this package there are no bells and whistles, just the necessities that will set you up for a once in a lifetime experience on the Oktoberfest Grounds. Let our experienced staff help with the often complicated planning process, and let’s check Oktoberfest off your bucket list! There are 14 large tents, each holding a different experience. While we can certainly do our best to supply a specific tent, we cannot guarantee it will be available during your stay. We can not guarantee a specific reservation time as well. The most attended days of the Oktoberfest are the weekend dates. Hotel rooms are in higher demand, so the local hotels price the rooms accordingly. Of course, we are able to arrange airport transfers, castle tours, and other things around Munich for an additional fee.